Although geographically distant from each other (Daphni is located in Attica, Greece, 11 km from Athens; Hossios Luckas in Phocis, 67 km from the capital, and Nea Moni in the centre of the island of Chios), the three properties belong to the same typological series and share the same aesthetic characteristics. 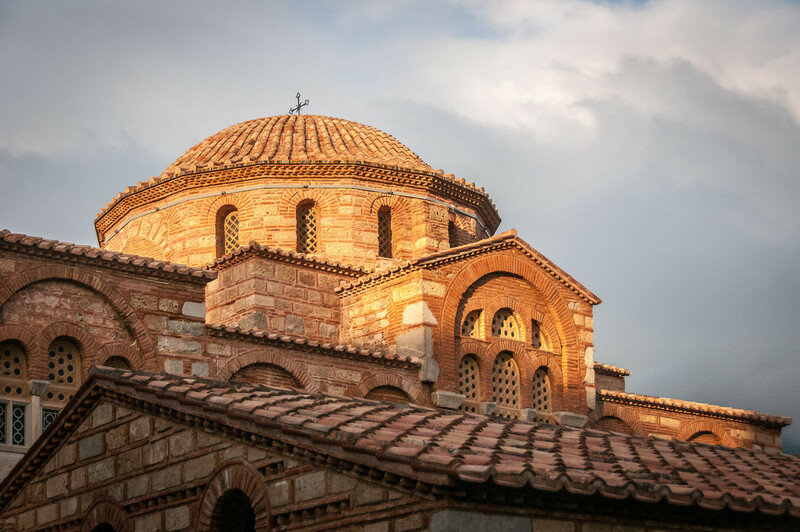 These three monasteries are outstanding examples of a type of construction characteristic of the middle period of Byzantine religious architecture. Nea Moni illustrates the simplest expression, an octagonal church with no added spaces. Hossios Luckas and Daphni are more complex: they have a central octagonal space surrounded by a series of bays that form a square. This more elaborate structure defines a hierarchy of volumes and functions and permits the implementation of an extensive iconographic and decorative plan. The Monastery of Daphni, located on the anciently sacred road from Athens to Eleusis, replaced a temple dedicated to Apollo Daphneios which had been destroyed in 396 AD. In the 5th century, a basilica was built adjoining a wall that had been restored and completed under the reign of Justinian (527-65). It formed a square enceinte, 97 m on a side; a large part of the north wall, originally 8 m high, survives. This first monastery, discovered through a series of archaeological remains, was abandoned during the Slav invasions in the 7th and 8th centuries. It was not until 1100, when the Byzantine Empire was at its apogee under Alexis I Comnenus, that it rose out of its ruins. The church was built at that time. It had a narthex, to which a two-story exonarthex was added a short time later. Other monastic buildings such as the refectory, cells and a well were built during the same building campaign and the church was sumptuously decorated with mosaics portraying the Dormition of the Virgin Mary. In 1205 the monastery was sacked by Frankish crusaders. In 1207 the Duke of Athens, Otho de la Roche, gave it to the Cistercians of the Abbey of Bellevaux. They built a cloister and remodeled the exonarthex and the enceinte wall but without altering the mosaics. Daphni was returned to Orthodox monks after Athens was taken by the Ottoman Sultan Mehmet II in 1458. Deconsecrated in 1821, the monastery has been undergoing restoration work since 1888. The Monastery of Hossios Luckas is 37 km from Delphi on the western slope of the Helicon: here a hermit named Lukas the Stiriote made his home in 946 among the ruins of a temple dedicated to Demeter. The holy man died in 953. A work on his life mentions a primitive church dedicated to St Barbara. In the latter half of the 10th century, construction on another church for pilgrims was begun. The topography of the vast polygonal enclosure of the monastery, which extends haphazardly on an east-west axis, still bears traces of successive additions and testifies to the enduring success of the cult to St Luke of Phocis. The immense central volume of the dome, 9 m in diameter, which rests on a drum pierced with sixteen windows, is supported on three sides by groin-vaulted bays. 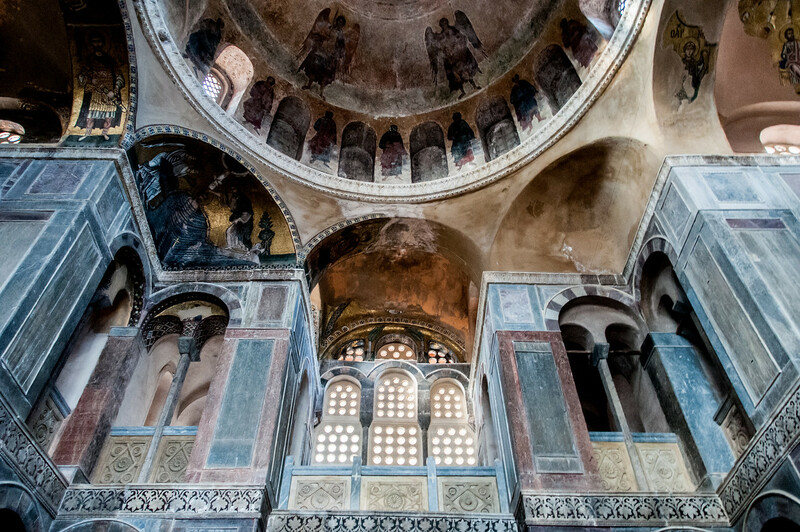 The bema and the apse define the cross-in-square plan of the church, which is one of the most perfect creations of Byzantine architecture. The church is filled with iconographic treasures of a magnitude and coherence rarely equaled. Its complex, compartmentalized plan is unified into a harmonious and luxurious whole by the rich decor of mosaics, frescoes, and marble slabs. The construction of the monastery of Nea Moni of Chios is fully documented as it was linked to a major event in Byzantine history. Constantine the Gladiator, a nobleman living in exile, was told by two monks of Chios, Nicetas and John, that he would become Emperor. When Constantine Monomachos married the twice-widowed 64-year-old Empress Zoe in 1042, thus becoming Basileus, he remembered the prediction. 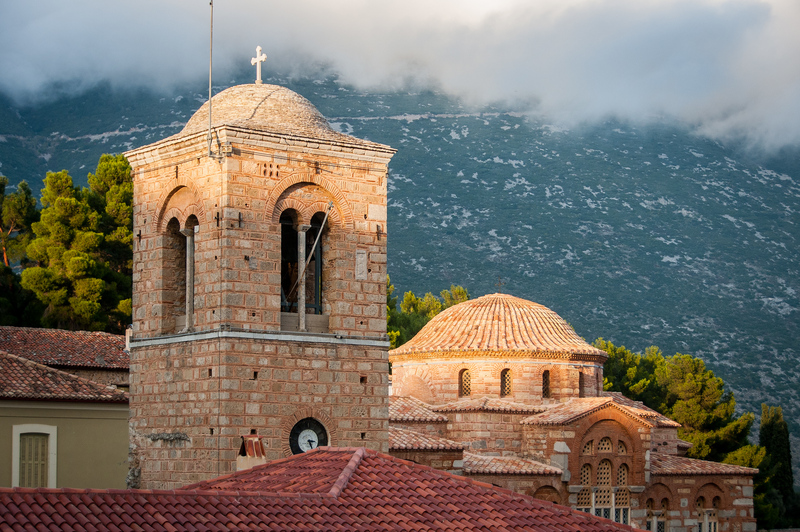 In 1045 he founded the monastery, choosing as its site a valley on Chios on the slopes of Mount Aetos and bestowing it with possessions and privileges. The dome, approximately 7 m in diameter, has no lateral bays but is placed between a triconch sanctuary and a narthex preceded by an exonarthex with lateral sides. The fairly rustic architectural design is carried over into in the more primitive style of the mosaics, which have a slightly Oriental flavor. Far from the somewhat abstract humanism of the decor at Daphni and Hossios Luckas, the typical characters portrayed at Nea Moni offer the stimulating counterpoint of more naïve art, a folk transcription of the great models of Constantinople. As you can see in the world heritage inscription, the Monasteries of Daphni, Hosios Loukas and Nea Moni of Chios consists of three different monasteries in three disparate locations. I visited 2 of the 3 monasteries: Delphi and Hossios Luckas (St. Luke’s). The Daphni monastery is located on the outskirts of Athens. It is across the street from an insane asylum and ‘Daphni’ is the local term for going to the asylum. It is currently under a massive renovation, repairing damage from an earlier earthquake. They are also cleaning the many frescos and mosaics in the church. The interior and exterior of the building are currently covered with scaffolding. This means there isn’t much to see until it is finished in 2016. However, until it is finished, it is open on Tuesdays and Fridays to the public. The upside of the scaffolding is that you can climb up to get a view of the mosaics that would otherwise be impossible. Hossios Luckas is located about 40km from Delphi. I visited on a late Friday afternoon and the doors were open. There is no admission price, nor were there any monks watching over the site when I was there. It appears to be bigger than Daphni, but it is hard to make a comparison with all the scaffolding. The artwork inside was exquisite. A trip to Hossios Luckas should be part of any trip to Delphi as you will have to pass nearby anyhow. Monasteries of Daphni, Hosios Loukas and Nea Moni of Chios is a cultural UNESCO World Heritage Site in Greece. It was added to the list in 1990 and is a religious and archaeological site linked to the Christian and Byzantine. The three sites that are included in this UNESCO property are masterpieces of the Byzantine art. These monasteries were built in the 11th to the 12th century. The Monasteries of Daphni, Hosios Loukas and Nea Moni of Chios feature nearly the same aesthetic features and typology. In addition, they are also known for their marble and mosaic decorations. The three component sites of the UNESCO property Monasteries of Daphni, Hosios Loukas and Nea Moni of Chios are all located at a distance from each other. The first component is the Monastery of Daphni, which is located in Attica close to Athens. On the other hand, the Hosios Loukas is located near Delphi in Phocida. Meanwhile, the last component site is the Nea Moni of Chios, which is located in the Aegean island of Chios. 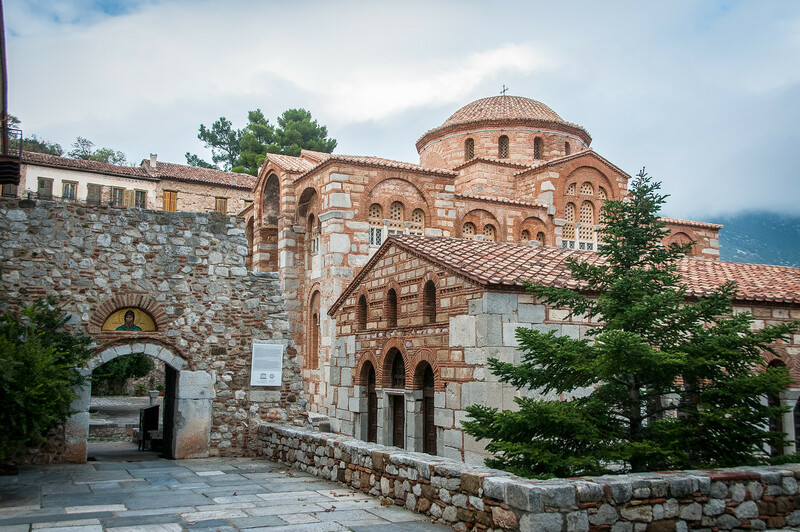 You can learn more detail about each component sites of the UNESCO property Monasteries of Daphni, Hosios Loukas and Nea Moni of Chios below. This is the first component site of the UNESCO property Monasteries of Daphni, Hosios Loukas and Nea Moni of Chios. It is an 11th-century Byzantine monastery that is located 11 kilometers from Athens. 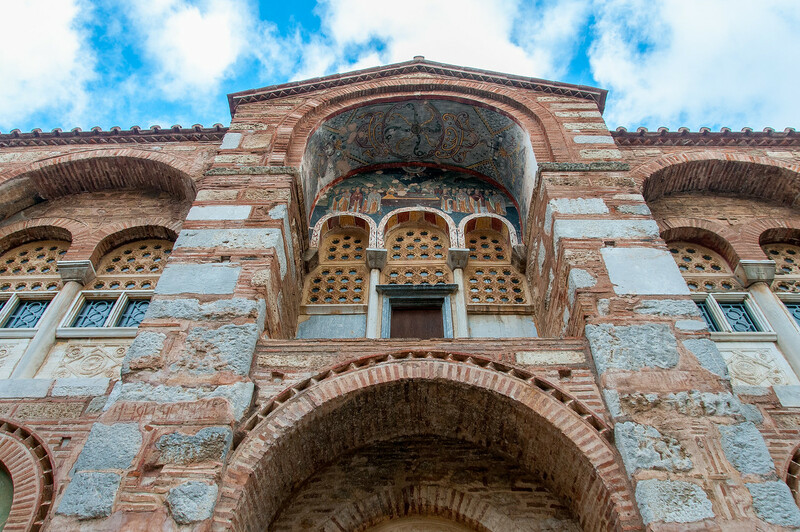 The monastery’s exterior architectural style is that of cloisonné style, which is a pretty common style used by churches in Greece during the mid-Byzantine period. Meanwhile, this monastery church follows a simple Greek cross-octagon floor plan. There are also various mosaics that comprise this building. Aside from the mosaic itself, there have been several studies done on the composition of the glass where these mosaics are painted in. This historic walled monastery is another component site of the UNESCO property Monasteries of Daphni, Hosios Loukas and Nea Moni of Chios. It is located in Boeotia in Greece. It is one of the most significant monuments during the mid-Byzantine architectural and artistic period. For this reason, it is included as one of the component sites of the UNESCO-listed property Monasteries of Daphni, Hosios Loukas and Nea Moni of Chios. Hosios Loukas is located on a scenic slope in Mount Helicon. It was founded by hermit Venerable St. Luke in the 10th century AD. The main shrine within the monastery is the tomb of St. Luke. It was originally located at the vault but was later placed at the juncture of two churches. It is the largest of the three monasteries listed in this UNESCO property. This 11th-century monastery is the final component of the UNESCO property Monasteries of Daphni, Hosios Loukas and Nea Moni of Chios. It is located on the island of Chios. This monastery is most significantly known for its mosaics. In fact, it is considered one of the best examples of Macedonian Renaissance art in Greece, along with the above two monasteries. 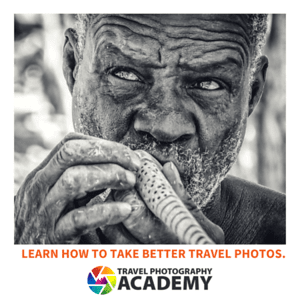 This monastery consists of two smaller churches, monks’ cells, a dining hall, reception hall, and a water cistern. The entire property is surrounded by a wall while a defensive tower stands on the northeastern corner.